We’d love your help. Let us know what’s wrong with this preview of The Witling by Vernor Vinge. This second novel by multiple award-winner Vernor Vinge, from 1976, is a fast-paced adventure where galactic policies collide and different cultures clash as two scientists and their faith in technology are pitted against an elusive race of telekinetic beings. Marooned on a distant world and slowly dying of food poisoning, two anthropologists are caught between warring alie This second novel by multiple award-winner Vernor Vinge, from 1976, is a fast-paced adventure where galactic policies collide and different cultures clash as two scientists and their faith in technology are pitted against an elusive race of telekinetic beings. Marooned on a distant world and slowly dying of food poisoning, two anthropologists are caught between warring alien factions engaged in a battle that will affect the future of the world's inhabitants and their deadly telekinetic powers. If the anthropologists can't help resolve the conflict between the feuding alien factions, no one will survive. To ask other readers questions about The Witling, please sign up. There wasn't really a lot TO this book--it was entertaining enough, but it really suffers in comparison with his later books like A Deepness in the Sky and a Fire Upon the Deep, which I think are some of the most interesting alien books I've read. I think someone mentioned this one on a mailing list I belong to, and it sounded kind of interesting: basically there's this planet where everyone has psychic powers, so they can teleport themselves and kill people at a distance and so on. People witho There wasn't really a lot TO this book--it was entertaining enough, but it really suffers in comparison with his later books like A Deepness in the Sky and a Fire Upon the Deep, which I think are some of the most interesting alien books I've read. I think someone mentioned this one on a mailing list I belong to, and it sounded kind of interesting: basically there's this planet where everyone has psychic powers, so they can teleport themselves and kill people at a distance and so on. People without the powers are called "witlings", hence the title. And the thing is that the crown prince guy is a witling! oh no! But then these other people show up who are explorers from other worlds, or something like the Federation, I think, and of course they're witlings too, but they're not all embarrassed about it, and the crown prince is enthralled by the idea of a world where everyone is like him. Oh, and then there's the 'charming' subplot where one of the explorers is this very surly woman, who is UGLY. but guess what, EVERYONE IS UGLY ON THE PSYCHIC PLANET. So the crown prince thinks she is BEAUTIFUL!! So they live happily ever after. The end. I just had to also mention that this book uses one of the absolutely lamest Lazy Plot Devices ever, (a favorite of Dan Brown) where you've been going along in a 3rd-person-omniscient-type narrative style, and then all of a sudden WE GO DEAF as the protagonist explains her brilliant plan to foil the bad guys, or discovers something that would ruin the plot if we knew about it. I started out giving this book 3 stars, as a perfectly serviceable sci-fi adventure; although certainly not up to the standards of Vernor Vinge’s later work (I absolutely love Fire Upon the Deep). It’s a First Contact story, and the premise is a little familiar, but not bad: anthropologists from Earth arrive at a seemingly non-advanced alien planet and gradually figure out that the native people have highly-developed mental abilities (teleportation). Those who lack these abilities are generally I started out giving this book 3 stars, as a perfectly serviceable sci-fi adventure; although certainly not up to the standards of Vernor Vinge’s later work (I absolutely love Fire Upon the Deep). It’s a First Contact story, and the premise is a little familiar, but not bad: anthropologists from Earth arrive at a seemingly non-advanced alien planet and gradually figure out that the native people have highly-developed mental abilities (teleportation). Those who lack these abilities are generally seen as useless slaves – Witlings – but in a twist, the crown prince is also a Witling. Naturally, he’s delighted to hear about a society where no one has the powers he lacks. So – all that is fine. However, the ending of the book bothered me, and kept bothering me until I deducted a star. (view spoiler)[Spoilers: At the end of the book, one of the anthropologists (who happens to be the only female character of any note in the entire book) is nearly killed in a conflict, and ends up with severe, irreversible brain damage. Amnesiac, and now lacking the intelligence and initiative she showed throughout the book, she will be happy to end up being cared for by the crown prince, who’s had an unrequited crush on her since the day they first met. OK, fine. That’s kind of yucky, but I don’t demand ‘nice’ outcomes for everyone. Tragedy can be great. What bothers me is the one line at the end, where an authorial voice feels the need to say something about ‘knowing a happy ending when you see one.’ Is this supposed to be ironic? That a brilliant, successful woman who’s always been given a hard time and never been considered attractive is now rendered ‘happy’ by having her personality and abilities removed and left in the care of a man who never really knew her, but finds her physically beautiful? I’m really not sure. (hide spoiler)]Does the author really have these opinions? I would like to think better of Vinge than that. Oh, and the illustrations are juvenile and rather dreadfully inaccurate. An unusual mix of high-concept science and fairly juvenile space adventure. I enjoyed it. A nice little story. Love how Vernor creates worlds and its creatures. As far as I can tell, “The Witling” is Vernor Vinge’s second novel, and to some extent, it shows. I enjoyed reading it, but it doesn’t have the depths of Vinge’s later works like “A Fire Upon the Deep” or less-known but also good “The Peace War”. The book is only about 175 pages long; I’m not the fastest reader and I finished in two pretty short sessions, also unlike Vinge’s other novels. The story opens with two humans who have become marooned on an alien world with human-like inhabitants. 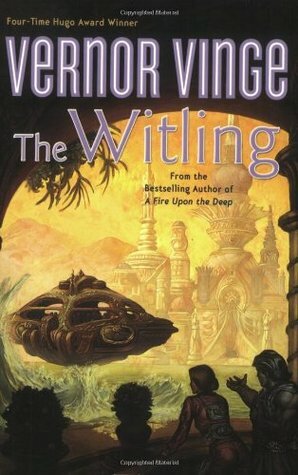 Only As far as I can tell, “The Witling” is Vernor Vinge’s second novel, and to some extent, it shows. I enjoyed reading it, but it doesn’t have the depths of Vinge’s later works like “A Fire Upon the Deep” or less-known but also good “The Peace War”. The book is only about 175 pages long; I’m not the fastest reader and I finished in two pretty short sessions, also unlike Vinge’s other novels. The story opens with two humans who have become marooned on an alien world with human-like inhabitants. Only after being captured do the humans realize that the natives have what we would call supernatural abilities: transporting themselves or objects by will of the mind. The magnitude of this ability varies from person to person; those with the least ability are called witlings. The two humans, with no ability, fall into this category. The prince of the realm also happens to be a witling, which is a great source of shame for him. He is intrigued by the humans, especially the woman. The humans must get off the surface, as all the alien foods naturally contain heavy metals, and continued exposure will be fatal. Although he provides no supporting science for the abilities of the aliens, Vinge does what I like best in sci-fi–he takes a simple premise and runs far with it. With these abilities, how would you imprison someone? How would you travel the world? Would you even need doors? How would you conduct warfare? These issues come up again and again through the book, and each time they are a delight. Another interesting point touched upon is body image. The book starts with the human male describing the woman, Yoninne, as ugly and unpleasant, too stocky and temperamental. The aliens, who it’s hinted have a slightly stronger gravity, are stockier, and to them, Yoninne is close enough in build, but different enough to be exotic and tantalizing. I haven’t read much sci-fi of this era that deals with such issues of perception; unfortunately, this thread is not continued throughout the book. The primary reason I rate “The Witling” as a 3/5 and not higher is because I found the ending unsatisfying. I won’t go into specifics in this review. The action was quite good and fun, but it conceptually bothered me. This review has been hidden because it contains spoilers. To view it, click here. REALLY BIG SPOILER ALERT. I quite liked this book up until the last few pages. The last few pages utterly spoiled for me a big part of why I liked it. There are two things I liked about this book. In this bo REALLY BIG SPOILER ALERT. In this book, the idea he explores is that the humanoids (and some other higher order animals) living on a particular plant can use telekinesis to teleport themselves and other things to certain locations. This creates a society where, for example, the "wings" of a palace can be spread apart over hundreds of miles, because the people inhabiting the palace can teleport easily from one wing to another. Because of this ability, these people never developed a lot of the technology that was primarily developed on Earth for getting people and things from one place to another. 2. One of the main characters is a human woman, a scientist who has come to study this planet. She is portrayed through the eyes of her partner (another scientist) -- and to some extent through her own eyes -- as very intelligent, physically unattractive (short, stout, and awkward), and having a brusque personality. None of this is a big deal. At the same time, the people native to this planet are even shorter and stouter, and so they see her as tall, willowy, and elf-like. She has some conflicted reactions to this. I don't see a lot of well-done explorations of body image in science fiction and especially in books written by men so I thought this was pretty cool. Toward the end of the story, she becomes brain-damaged. At the very end of the story, she's back with humans who have the medical facilities to treat some of the damage, but she probably won't get her mind and intelligence back again. But that's OK, she's perfectly happy because someone is in love with her and that's all that matters. This book has a nice clear story with an unusual heroine, and a well-conceived and original scenario unlike any other I can think of. It makes use of teleportation and telekinesis; but the teleportation is not quite the same as Alfred Bester's jaunting, and the difference has interesting effects on the resulting society. It's the story of two relatively normal humans marooned on an abnormal planet, so I'm reminded vaguely of Mission of Gravity and The Left Hand of Darkness. As with Mission of Grav This book has a nice clear story with an unusual heroine, and a well-conceived and original scenario unlike any other I can think of. It makes use of teleportation and telekinesis; but the teleportation is not quite the same as Alfred Bester's jaunting, and the difference has interesting effects on the resulting society. As with Mission of Gravity, the situation is of more interest than the characters, but Vinge's characterization is at least more interesting than Hal Clement's. It seems that some readers are disappointed because they read Vinge's later books first, and came to this one expecting something similar. I think that's an inappropriate comparison: this is a book from 1976, inspired by the sf of the 1950s and 1960s, which Vinge would have grown up reading. If you compare it with the sort of books that were around at that time, it's a well-made and original novel and I value it. The idea of teleportation has always appealed to me, so a world where this is an inherent natural ability is interesting. Vinge thinks it through to a rich degree, describing novel uses for the ability, and limitations that stop it being all powerful, while still making sense within the narrative. In addition, there's a good plot, as the two human explorers try to contact home, and find a way off a planet whose abundance of heavy metals will, in due course, kill them. There's some interesting wo The idea of teleportation has always appealed to me, so a world where this is an inherent natural ability is interesting. Vinge thinks it through to a rich degree, describing novel uses for the ability, and limitations that stop it being all powerful, while still making sense within the narrative. In addition, there's a good plot, as the two human explorers try to contact home, and find a way off a planet whose abundance of heavy metals will, in due course, kill them. Space travelers (from a human space colony) come to a new planet of humans with unusual mental powers. The weak thing about the book is the plot which, althoug Space travelers (from a human space colony) come to a new planet of humans with unusual mental powers. Two people, apparently descendents of earth, get stranded on a planet where the inhabitants have an unusual talent that has caused their society to develop in an unusual way. I felt Vinge was altogether to taken with exploring how this unusual talent would work so that much of the book required an understanding of maths and physics to appreciate it. There was some human interest, but it felt rather shallow. The writing style did not draw me in. Quite a short story, but entertaining. In typical Vinge style, the aliens' world is believable, although in this early book still a bit simplistic. Still, some entertaining ideas on how a race would develop when given extraordinary powers. His really excellent later books do a much better job of imagining an alien civiliation that is utterly different from ours, but still make you feel part of it. Vernor Vinge has written some great novels, but The Witling definitely does not live up to his other works. Premises were interesting enough, but the story is not too captivating, and in its short length, really offers nothing substantial. The ending involves a gratuitous 20 pages where everything is suddenly "resolved" without really having any kind of climactic plot. Vinge is a great writer, but look elsewhere! Originally published in 1976, Vinge's carefully thought through science also addresses social issues like beauty and status. I particularly enjoyed that the "stocky" abrasive woman pilot was, essentially, the heroine and perceived as beautiful by the planet's inhabitants (who had evolved from humans). A fun and interesting read, but not as good as Vinge's other books. No surprise there, as this was one of his first. Interesting to see this snapshot of his development as a writer. His skill with character development was very strong, even at this early stage, but the story structure was less polished than, say, A Deepness in the Sky, or A Fire Upon the Deep. This is the first book I've read by Vinge, and definitely plan to read others. This book is more about "ingenious people use science to save themselves" (and the strange natural ability of the inhabitants of Gira, and how they navigate), and that was good as far as it went, but I'm expecting more political philosophy from his others. What this book taught me: Vernor Vinge is brilliant when he's writing great SciFi, but boring when he is writing pulp. This book is dated, and if you're hoping for more of what makes Across Realtime or Fire Upon The Deep so great, stay away from The Witling. I gave up in chapter 3, returning this to the friend I borrowed it from. It is hard to believe that this book was written over 30 years ago. It was well written and a quick read. This is the story of two people stranded for some time on a foreign world, a world where teleportation is a "Talent" that most people have. The story tells of their quest to get back home. Simple yet kinda subtle. Vinge has been a serious science fictionist for a long time. This book is about physics and spherical geometry. Not the best Vinge, but a good idea-based sci-fi adventure. So far it's the usual awesomeness from Vinge. Another fantastic alien culture. Early work. Holds up well to rereading. It's a fun combination of fantasy and sci-fi, plus a plot that moves and some entertaining characters. This isn't bad, but not nearly as good as Vinge's other work. Good early pulp sci-fi. I enjoyed the character development and story. The hard science was a little much for me, but the concept was well described. Vernor Steffen Vinge is a retired San Diego State University Professor of Mathematics, computer scientist, and science fiction author. He is best known for his Hugo Award-winning novels A Fire Upon The Deep (1992), A Deepness in the Sky (1999) and Rainbows End (2006), his Hugo Award-winning novellas Fast Times at Fairmont High (2002) and The Cookie Monster (2004), as well as for his 1993 e Vernor Steffen Vinge is a retired San Diego State University Professor of Mathematics, computer scientist, and science fiction author. He is best known for his Hugo Award-winning novels A Fire Upon The Deep (1992), A Deepness in the Sky (1999) and Rainbows End (2006), his Hugo Award-winning novellas Fast Times at Fairmont High (2002) and The Cookie Monster (2004), as well as for his 1993 essay "The Coming Technological Singularity", in which he argues that exponential growth in technology will reach a point beyond which we cannot even speculate about the consequences.